Distribute wedding bubble pots by placing them on each individual seats before the wedding ceremony. If you’d rather wait until the end of the ceremony, have someone handing them out as the guests leave after the vows. This is an ideal way to get younger relatives involved in your day, or could be the duty of a junior bridesmaid or usher. While most wedding bubbles are advertised as non-staining, and therefore shouldn’t mark your dress, it often depends less on the ingredients of the bubble mix and more on the particular material of your dress. Check this out by blowing bubbles at a sample piece of wedding dress fabric to see how it responds. There are a number of bubble pot designs specifically tailored towards weddings. You may choose a pot the shape of a champagne bottle or those designed to resemble miniature wedding cakes. Some are even topped with doves and hearts. Customise these containers by having a personalised label printed, which could also include a bride and groom caricature, your names, and the date of your occasion. A low cost alternative is to tie a ribbon in your wedding colour around a plain white pot. 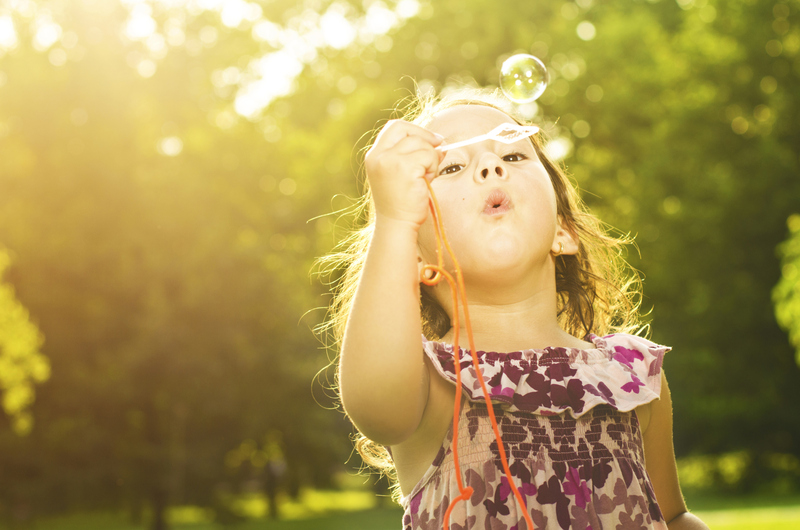 Bubbles can be used to produce natural smiles from the faces of your young relatives, flower girls and pageboys when they are being photographed. If they’re very young have another guest blow bubbles for them, or if they are a bit older give them the bubbles to blow themselves, and you’ll get some beautifully natural shots of them enjoying themselves. Bubble machines are used to create a constant stream of bubbles, without having to rely on your guests to sustain blowing for a long period of time. They are also useful on a breezy day when self-made bubbles may quickly get blown away. 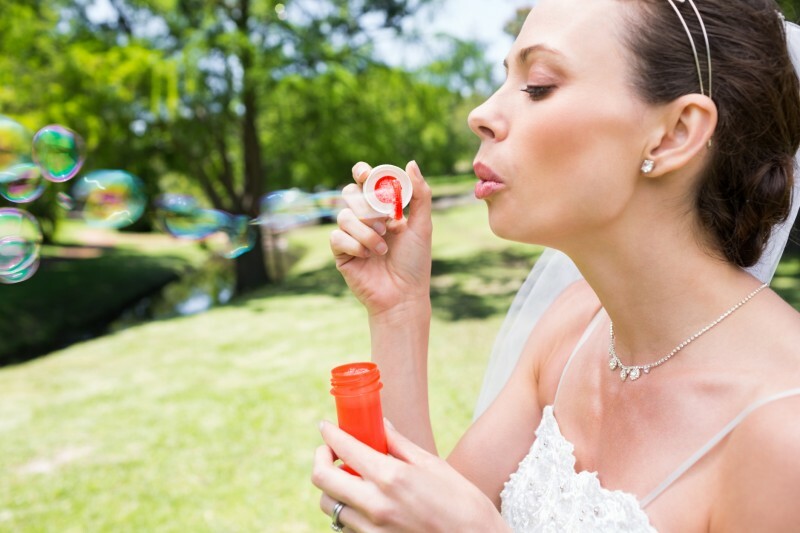 Should you be thinking about featuring bubbles in your wedding photographs, buying or hiring a bubble machine is a great idea. Wedding bubbles don’t just have to be restricted to the end of the wedding ceremony, indeed they can be used to highlight key events throughout the day; during your first dance for example. Bubble bottles can be placed on tables at the reception, allowing your guests to use them whenever they feel appropriate. They would also make perfect wedding favours.